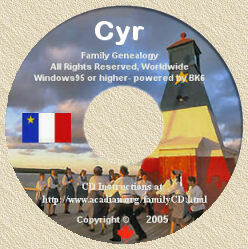 Acadian Genealogy Homepage; Vermillionville, Louisiana! In 1755, the French-speaking Acadians of what is now Nova Scotia, were driven from their homes for refusing to swear allegiance to the British Crown. Like so many immigrants and expatriates from all over the world, they sought a better life for themselves and their children. Their search lasted through years of wandering, until the King of Spain invited them to settle in a new home. These Acadians-Cajuns joined the Creoles...New World descendants of African, West Indians and Europeans whose presence dated back to the earliest days of the explorers; and several Native American tribes which inhabited the area of South Louisiana. The immigrants settled along the bayous and across the prairies, farming Spanish land grants. Small towns began to appear and grow. One of those bayous was Bayou Vermilion, and one of those towns was Vermilionville. Today Vermilionville is a living history museum and folklife village, in Lafayette, Louisiana (the original Vermilionville). It celebrates the cultures of these people who settled in the southern part of the state, more than 200 years ago. Located on the banks of the Bayou Vermilion in what has been called one of the most culturally rich regions of the United States, Vermilionville authentically portrays a way of life preserved with a distinctly French accent. It reveals a history of hard work and good times and a rich and proud heritage that endures to this day. These unique cultures somehow survived being swept up into the American mainstream - through statehood, wars and economic upheaval - even when their children were forced to abandon their beloved French, as English became the official language in schools. Vermilionville faithfully and authentically represents the depth, endurance and resolved of a segment of American culture, that never quite dissolved into the great melting pot. It's been said that what man needs most as the 21st century begins, is a sense of place...Vermilionville provides that for all who visit, as well as a journey into the past! Vermilionville is a non-profit educational institution operated by the Vermilionville Historic Foundation Inc., and is located at 1600 Surrey Street, Lafayette, Louisiana. For more information, call (318)233-4077 or 1-800-99-BAYOU, or write P.O. Box 2266, Lafayette, LA 70502-2266.